After class this morning one of my students asked me about the quote then sarcastically said, “That’s not a tough one at all.” I have been sharing this quote with students for a week now because it is something I need to be reminded of daily right now. As we embark on a new month can you give yourself permission to slow down, to pause even, and connect with your authentic self? Can you give yourself permission to listen to what your authentic self is telling you? It’s not easy. Listening to the answers that we already know deep down can initially be confusing, painful, and truly difficult. Not listening to those answers can be detrimental to our inner peace and overall ability to find contentment within our lives and our relationships with others. I leave you with my own personal story of stopping to listen to an answer I knew at my core and allowed myself to listen to, despite a tremendous amount of fear and trepidation. Prior to becoming a yoga instructor I worked as a dance/movement therapist providing group psychotherapy to some of New York City’s most mentally ill. The hospital I worked at went bankrupt and closed just as my career was beginning. I went back to the hospital I had worked at prior to that job, but found myself miserable. After lots of struggling I allowed myself to hear the answer to the question, “Should I stay or leave?” The answer, as unpopular and unrealistic as it seemed, was, “Leave.” So I left…that was just a baby step in acknowledging what my authentic self wanted. I looked for other creative arts therapy positions. I went on interviews. I was too direct with questions; too unenthused. I was consciously sabotaging myself because I knew I was not on the path I was really meant to be on, but I could not yet admit that to myself. I even accepted a position then turned it down when human resources started hounding me to come in and sign the paperwork. Finally, the event that caused my authentic self to scream at me occurred. I had an interview for a position that was unionized under the same union I had been with when I was laid off due to the hospital bankruptcy. I was still paying union dues to receive unemployment and health benefits. This hospital had to hire me because of my union rights. I had to take the job if I wanted to keep my benefits. I knew that was probably my last opportunity for a full-time position as a dance/movement therapist with benefits. The economy was in shambles. I had bills to pay. A piece of paper in my desk drawer proclaimed I had earned my overpriced Master’s degree and the student loan debt that went along with it. I asked myself, “Should I accept this position?” When I really stopped to listen the answer was, you guessed it, “NO!” I was scared. 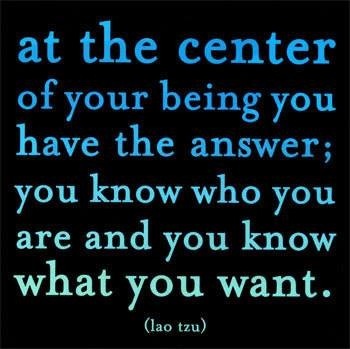 I had no Plan B.
It’s been almost three years since I paused to listen to the answer at the center of my being. Shortly after declining the position I began a yoga teacher training program. Over the last two and a half years I have come to realize that teaching yoga is what my authentic self truly wants. It’s not easy, or glamorous, it doesn’t even pay that well financially, but the daily rewards of teaching are too numerous to count. There were moments of doubt, fear, even twinges of regret. I had to give something up and that is never easy. I share this story with you in the hopes that you are able to find the courage to truly check in and listen to your authentic self. It is not easy, but it is possible, and you will not be alone on your journey. You already know the answer. You already know who you are. You already know what you want. Give yourself permission to listen and act accordingly. This entry was posted in Uncategorized and tagged answers, authentic self, choices, creative arts therapy, dance/movement therapy, fear, mentally ill, questions, yoga. Bookmark the permalink.